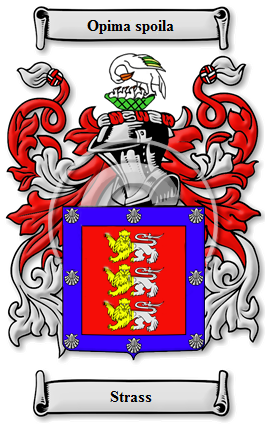 The name Strass has been recorded in many spellings including: Strase, Strass, Strasse, Strate, Strasseman, Straetmann, Stratemann, Stratthoff, Stratiff, Stratz, and others, this is a surname of Roman and Germanic origins. With often overlapping spellings which blur the origin, it is seemingly recorded across Eastern Europe. It derives either from the ancient Roman (Latin) word "straet" meaning a main road, and hence somebody who lived by such a place, or from a German pre-medieval word "stratz" meaning vain. As such it was originally given to somebody who was believed by his associates to be vain and pompous, or possibly given the robust humour of the period, the total reverse!